San Matteo's Cathedral has also its own museum, called "Museo Diocesano". 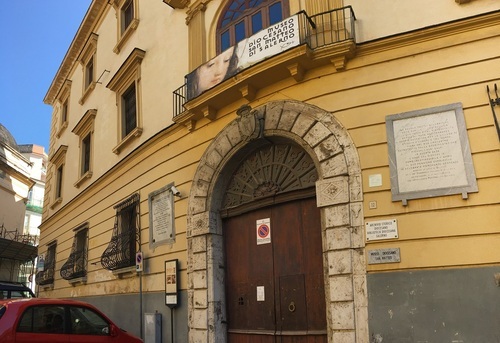 On the frontage of this museum there is a stone that was unveild in 19691, which remembers that the Cathedral was one of the locations of the Schola Medica Salernitana. 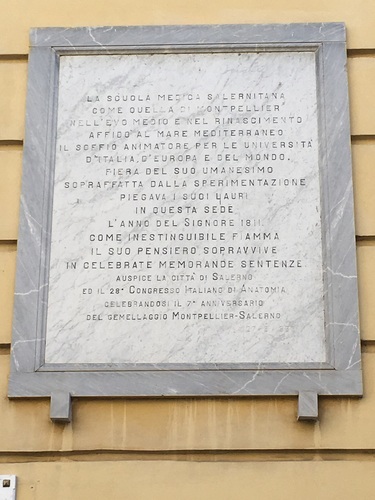 The Italian text reads as follows: "LA SCUOLA MEDICA SALERNITANA / COME QUELLA DI MONTPELLIER / NELL' EVO MEDIO E NEL RINASCIMENTO/ AFFIDO' AL MARE MEDITERRANEO / IL SOFFIO ANIMATORE PER LE UNIVERSITA' / D'ITALIA, D'EUROPA E DEL MONDO. / FIERA DEL SUO UMANESIMO / SOPRAFFATTA DALLA SPERIMENTAZIONE / PIEGAVA I SUOI LAURI / IN QUESTA SEDE / L'ANNO DEL SIGNORE 1811. 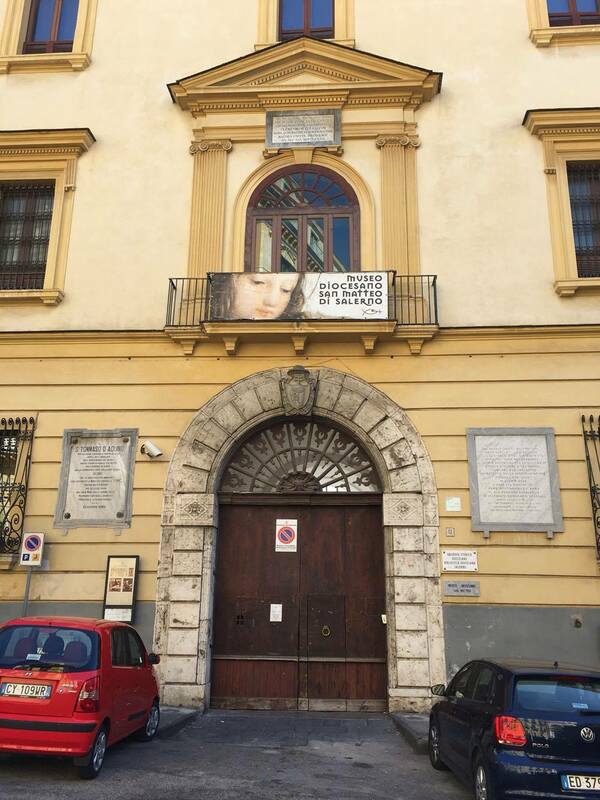 / COME INDISTINGUIBILE FIAMMA / IL SUO PENSIERO SOPRAVVIVE / IN CELEBRATE MEMORANDE SENTENZE / AUSPICE LA CITTA' DI SALERNO / ED IL XXVIII CONGRESSO ITALIANO DI ANATOMIA / CELEBRANDOSI IL VII ANNIVERSARIO / DEL GEMELLAGGIO MONTPELLIER-SALERNO". A possible translation is: "DURING THE MIDDLE AGE AND THE RENAISSANCE / SCHOLA MEDICA SALERNITANA / SUCH AS MONTPELLIER / GAVE TO THE MEDITERRANEAN SEA / THE ANIMATION BREATH FOR THE UNIVERSITIES / OF ITALY, EUROPE AND ALL THE WORLD. / PROUD OF ITS HUMANITY / OVERPOWERED BY EXPERIMENTATION / PERSUADED ITS LAURI / THERE / THE YEAR OF LORD 1811. / AS AN INDISTINGUISHABLE FLAME / ITS THOUGHT SURVIVES / IN FAMOUS SENTENCES / HOPE FOR THE CITY OF SALERNO / AND THE XXVIII ITALIAN ANATOMY CONGRESS / CELEBRATING THE 7th ANNIVERSARY / OF MONTPELLIER-SALERNO TWINNING".